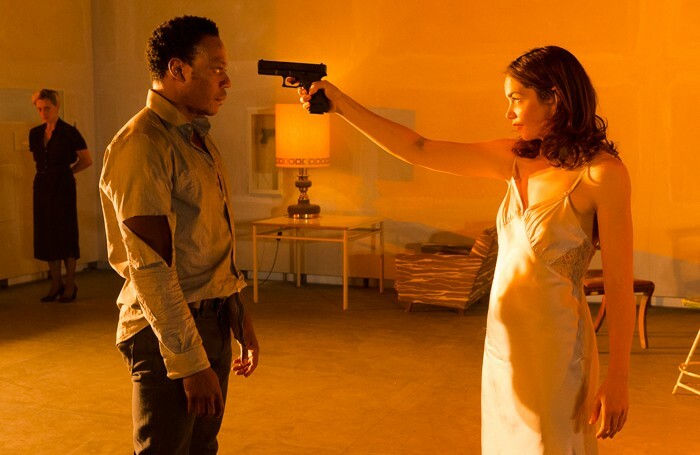 Three cheers for Natasha Tripney’s challenging review of Ivo van Hove’s production of Patrick Marber’s Hedda Gabler at the National Theatre. Male director, male adapter. A story centred on a woman’s losing struggle for independence, an opportunity missed for a woman director and adapter? Clearly these classics need to stay in the repertoire at least for the education of the next generation, and they present rare opportunities for a leading actress to take centre stage. However, in the drive for 50/50 representation of women, on stage and backstage, there must be the same level of investment in all its forms in the playwrights of new work. This is crucial for changing the cultural landscape. There is still a pressing need for pioneering at all levels in challenging male dominance in theatre. Women across the UK are forming companies and projects to tackle the cultural deficit, but they need support and development. On November 20, Sphinx Theatre Company mounted a festival of new short plays, Women Centre Stage, at Hampstead Theatre, London. The roll call of 100 writers, directors and actors in 2016 included many young writers: Chloe Todd Fordham, Rose Lewenstein, Dawn King, Georgia Christou, Charlene James, Vinay Patel, and established writers, actors and theatre-makers: April De Angelis, Rebecca Lenkiewicz, Winsome Pinnock, Timberlake Wertenbaker, Howard Brenton, Tanika Gupta, Janet Suzman, Beatie Edney, Ann Mitchell, Maggie Steed, Stella Gonet, Graeae, and many others who contributed to the seven hours of programming, performed for the audience of 1,000. It found wide support and investment from across the profession and kick-started ideas, connections and new plays. However, shockingly, there is a 40-year context for this, started by Ed Berman’s 1973 groundbreaking festival of women’s plays at the Almost-Free Theatre. In 1983, when I commissioned the first survey into the representation of women in UK theatre, of produced playwrights, 7% were female, and Agatha Christie accounted for 22 of the 42 productions by women playwrights that year. Just 12% of directors were female, and 30% of actors. In the 1980s, Peggy Ashcroft, Pam Gems, Jane Lapotaire, Diana Quick and indeed Glenda Jackson headed up the Women’s Playhouse Trust, building on the 1970s explosion of fringe companies such as Monstrous Regiment, the Women’s Theatre Group and Cunning Stunts. The recent figures from Purple Seven (women playwrights at 28%, directors at 36% and actors at 39%) point to some inroads, but where is the substantial strategic thinking and planning among the funders, artistic directors and gatekeepers to make real progress? The show seemed a shop window for pop stars and West End shows. Why does so much television not include real variety? I have just had a weekend in Paris and in all the five shows I saw (cabaret and circus) it was the amazing specialties that received the most applause. I also felt that the mention of Bernie Clifton as the running gag throughout the programme was very unfair to him, one of the funniest men around. You need to see at least part of one of his many routines to appreciate his skill and then for David Walliams to completely overshadow him at the end of the show was wrong. Come on TV producers and comedy promoters – please include specialities in your programme and help reinvent variety. How lovely for the cast of Liverpool Everyman’s return to rep. I remember how audiences loved to see you playing different parts in a little weekly rep in Spennymoor, County Durham – the miners were great audiences – for shows from Dracula and East Lynne to The Gay Dog and Flare Path. In Reefer Girl I was one of the sisters, and had the scariest dry when asked my name and couldn’t remember the name of the sister I was playing at that moment. As assistant stage manager, I also had to find props and costumes. I had wonderful digs where the landlady provided four meals a day, baths when I wanted and an electric fire in my room for £2 10s a day. All the best to the new company in Liverpool.